The Capital has been painted yellow after a massive swing in votes to the SNP saw Labour knocked out in almost every seat in the city. Three out of the four Labour-held seats fell to the SNP along with Edinburgh West, which was previously held by the Lib Dems. However, there was some good news for Labour as Ian Murray held Edinburgh South. Out go Mark Lazarowicz, MP for Edinburgh North and Leith since 2001, Sheila Gilmore in Edinburgh East, and Lib Dem Mike Crockart from Edinburgh West. The final tally in Scotland. Deidre Brock, the new MP for Edinburgh North and Leith, said the landslide result was a “real indicator” people across the country had faith in the SNP and “in the message that we are getting out there”. She said: “I think this is a real indicator not only of the faith that people have in the party and in Nicola – who has been a fantastic leader in this election – but also belief in the message that we are getting out there. “The team has worked incredibly hard, and have just been trying to make sure that that positive message that the SNP has gets out there. “I’m incredibly grateful to them all for their hard work and I’m incredibly grateful to the people of Edinburgh North and Leith who appear to have put their faith in the SNP and our message of anti-austerity. “This proves that that is what people are crying out for – they are not looking for more cuts to public services. Things have changed: How the political landscape compares with the last election. “Around the referendum, a lot of people felt very uncomfortable at the sight of Labour hand in hand with the Tories. And there’s also the fact that they have continued to have that austerity agenda, which is not what people want. “I see it myself as a councillor – that council services and the cuts to benefits are having a terrible effect. Iain McGill, the Tory candidate in Edinburgh North and Leith, said it was “a heck of a result” for the SNP to have gone from fourth to first place. But she said: “The SNP need to be clear – this big victory is not a vote for another referendum. Tommy Sheppard, victorious for the SNP in Edinburgh East, said: “We made a positive case that this was about giving Scotland a stronger voice within the UK. “That message resonated with the people in the wake of the referendum – people decided to stay in the UK but whether they voted Yes or No they want to make sure Scotland’s voice cannot be ignored. “People also saw it was time for a change in economic policy and an end to austerity. “Although this was nothing to do with independence, it is about a national expression of self confidence. In Edinburgh West, Lib Dem Mike Crockart lost to the SNP’s Michelle Thomson. Ms Thomson said the SNP had fought an optimistic campaign and people had responded well to it. She said: “I enjoyed standing in the constituency where I brought up my family and have lived and worked for the last 23 years. Senior Lib Dem councillor Paul Edie, who was part of Mr Crockart’s campaign, said: We fought a good campaign and we got close, but not close enough to keep it. “We will have to go back and rebuild from the base. “But there’s no disgrace in losing on a night like this. There are lots of safer seats among all parties which are being lost. Joanna Cherry, who stormed to victory in Edinburgh South West, said: “We have had a fantastic response and great campaign returns. “Today going round the polling stations, we’ve had a great response from members of the public – and that response is something we have been getting across the city, in affluent and less affluent areas. “The opinion polls are borne out by what’s happened tonight. People lost confidence in Labour’s ability to represent Scotland, and didn’t like the way they were joined at the hip with the Tories during the referendum. “I also think people have looked at our record in government and saw that we were a strong and competent. The SNP also easily ousted Labour in other constituencies across the Lothians. “What a difference ten years can make. This result is clearly nothing short of historic. I will stand up for everyone, regardless of their political view. “I will do my very best to make sure that the voice of Midlothian is heard loudly and clearly. I will do everything I possibly can to work across the political spectrum to undertake the role that I have been entrusted with. Mr Young, who was aiming to replace long-serving Labour stalwart David Hamilton, said: “I am grateful to David Hamilton for all his guidance and sorry I couldn’t build on his good work. Mr Hamilton, who announced he was standing down in January, said the SNP’s incredible success across Scotland had left him fearing for the country’s future. He said: “What’s sad is that there will be another referendum before we know it. The two winners tonight will be the SNP and David Cameron, who has practically wiped out Scotland. Labour was also forced to relinquish its grip on East Lothian amid the Nationalist advance on Westminster. Fiona O’Donnell saw her majority of 12,258 wiped out by journalist and economist George Kerevan. A dejected Ms O’Donnell conceded defeat soon after counting began at the Corn Exchange in Haddington, acknowledging there had been “a mood in the country” that was something that couldn’t be stopped. West Lothian also lost both of its Labour MPs as Graeme Morrice and Michael Connarty were ousted from Livingston and Linlithgow and East Falkirk respectively. 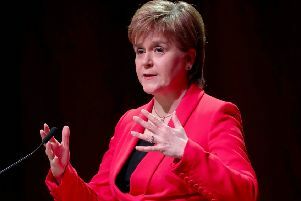 Mr Connarty, an MP for 23 years, said: “I think basically what’s happened is that people have been taken in by the big campaign, the cult of personality of Nicola Sturgeon and they’ve gone for it here as much as they’ve gone for it anywhere else. Tom Harris, Labour’s candidate for Glasgow South: “The fact is there remains a great deal of resentment among those Labour voters who voted Yes in the referendum against the Labour Party which is seen rightly – and I’m proud of it – to have been an obstacle to independence. Wow! Wow! And thrice wow! As I sip a full-bodied red and smoke a cigar in the hope of liberating a Cuban from communist poverty, I nearly fall of the sofa on seeing the exit poll. What’s this?! The Conservatives climbing to 316 seats, Labour falling to 239 and the Liberal Democrats on only ten? And wait, the SNP on an astonishing 58 and Ukip hanging on to its current two? Either the pollsters who did the daily polls or the ones that did the exit poll have screwed up – so different are they that they can’t both be right. Then the results started to come in and guess what, so far they have all been wrong – with the Tories doing even better than the exit polls and Labour doing worse. I’ll need to open more wine. Whatever the result – and it could be a very long night – there are already a few myths being created that need to be put to the sword. One is that the SNP cost Labour victory. But on this (projected) performance, even if the SNP won all 59 Scottish seats David Cameron’s Conservatives will have “won” it for themselves while Labour lost seats in England too. Time for the men in grey suits to speak to Mr Ed. Tory government to moan about for five years while having nearly three score MPs to keep Labour in turmoil in Scotland while creating headlines in London. As was the way with the Olympics and other big national events, I found it was quicker to follow the results on Twitter than listen to the mostly sanctimonious talking heads in the TV studios – not least for the humour. One wag predicted I’m a Celebrity... could have Farage, Galloway, Clegg and Balls in it this year while another celebrated our national debt would be written off by Lib Dem lost deposits. I spilt my wine guffawing! Now as I type my last few words before going back to the telly, I read on Twitter that the Tories are on course to an overall majority. POLICE are investigating two allegations of electoral fraud in the Capital. It is understood the incidents, which involved someone allegedly illegally impersonating another voter with the intention of using their vote, occurred in Gorgie Dalry Parish Church in Edinburgh South West and Edinburgh South Neighbourhood Office. The ballot papers in question were identified and removed by police, who are believed to be looking for traces of DNA on the sheets. A spokesman for the city council said: “Polling staff raised concerns over two possible cases of voter personation.